The Presidential election is over. Thank God! Now it’s time to stop whining and start planning. In the words of Winston Churchill, “Keep calm and carry on.” With that in mind, here is what you need to know about year-end tax planning. Let’s take a moment to discuss the difference between tax planning and tax compliance. Tax compliance involves filling out your tax forms correctly and on time. The question is: Given this set of tax facts, what taxes do I owe? It’s a pretty straightforward exercise. The deadline for compliance on personal returns is April 15 (or October 15, if extended). The tax planning question is, “Given my financial situation, what options do I have to lower my tax burden?” There are tax planning opportunities to shift taxes from year to year, defer taxes for many years, or even permanently reduce taxes (without reducing income, of course). The deadline for tax planning, with few exceptions, is December 31. After year-end, your tax facts are pretty much set in stone and there isn’t a whole lot you can do about it. Tax planning is the creative side of tax accounting. I usually wait till the end of my articles to encourage you to use a tax professional, but, in this case, I’m going to do it right now. Using a tax professional for compliance is often just a matter of convenience on the part of a taxpayer; using a pro for tax planning is an absolute necessity. Enough said. With Obama continuing in office, I can assure you that ordinary tax rates will not go down in 2013. They may stay the same, but there is no question that, as a matter of general tax planning, you should count on a higher tax burden next year. Ordinary tax rates for the “wealthy,” couples making $250,000 or more and singles $200,000 or more, may go up, although not by enough to warrant an outright panic (if you make that much money and panic, at least you’ll have the $$$ for psychotherapy or really effective prescription drugs). If you’ll look back at my pre-election article in the October issue of CH2, you’ll note that the marginal tax rates for these two groups will increase from 33% and 35% to 36% and 39.6% respectively if ( and this is a big “IF”) Obama’s tax plans pass a Republican-controlled House of Representatives. Capital gains rates will go up for the “wealthy,” probably to 20%, and may go up for everyone if the “fiscal cliff” is not averted. The tax on qualified dividends may go up substantially, because under both Obama’s plan and the “fiscal cliff” scenario, they will be taxed the same as ordinary income; e.g. a taxpayer in the top bracket will pay 39.6% on dividend income…and more. ObamaCare is here to stay, and next year two new taxes will kick in. To refresh your memory, there will be a 3.8% tax on investment income (primarily capital gains, dividends and interest) for the “wealthy”; e.g. a taxpayer making $280,000 in taxable income with $20,000 in capital gain will pay an additional tax of $760 ($20,000 × 3.8%). There will also be a .9% payroll tax on earned income above the “wealthy” threshold amount; e.g. if an individual makes $220,000 in salary, he or she will pay an additional tax of $180 ($20,000 x .9%). Also in 2013, the threshold for the medical expense deduction increases from 7.5% to 10% of adjusted gross income (AGI) for those taxpayers under age 65. At this point in time, there has been no “fix” made to the Alternative Minimum Tax for 2012, so the current exemption stands at pre-2001 levels of $45,000 for a married couple (the exemption was at $74,450 for 2011). 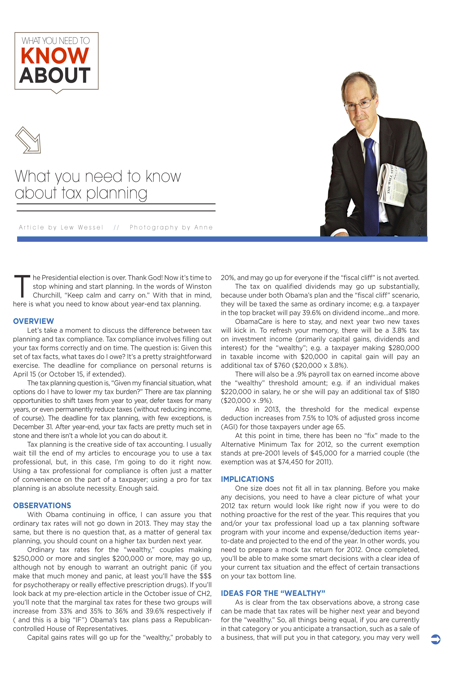 One size does not fit all in tax planning. Before you make any decisions, you need to have a clear picture of what your 2012 tax return would look like right now if you were to do nothing proactive for the rest of the year. This requires that you and/or your tax professional load up a tax planning software program with your income and expense/deduction items year-to-date and projected to the end of the year. In other words, you need to prepare a mock tax return for 2012. Once completed, you’ll be able to make some smart decisions with a clear idea of your current tax situation and the effect of certain transactions on your tax bottom line. Roth conversion: This needs to be done prior to year end, although it can be reversed after year-end if you have second thoughts. Any amounts converted will increase your taxable income, so this is a good strategy if your goal is to eat up a prior year NOL or to just max out the amount of income taxed at lower marginal rates. Capital gains: Long-term capital gains are currently taxed at a maximum of 15% and at 0% if you are in the 10% or 15% marginal income brackets. You can pretty much generate gains at will, although you cannot do the same with capital losses due to “wash-sale” rules. Again, if you think you will make over $250,000 next year and in the future, it may be a very good strategy to recognize capital gains this year before rates go up and ObamaCare surcharges begin. I’ve encountered a couple of people selling businesses or appreciated property this year on the installment plan, e.g. the buyer will pay the asking price over 10 years in 10 equal installments. The default rule in an installment sale is to recognize income as the payments are received, but you can and perhaps should opt to recognize all of the gain in 2012. This decision can be made after December 31, but you must officially declare your choice on a timely filed return (i.e. you can’t change your mind two years into the deal). Don’t wait till the last minute to consult your tax pro on this one! The small business owner with a regular C corporation (not a sub-S or electing LLC) may want to pay dividends out of the corporation in 2012 to avoid the potential for these distributions to be taxed at higher rates in 2013 and beyond. Certain itemized deductions can be timed. These include property tax payments (in South Carolina, at least), charitable deductions, and, to some extent, medical deductions. If you want to increase your taxable income in 2012, you can defer these deductions to 2013. Beware, however, that under the pre-2001 tax law, which would come into effect along with the “fiscal cliff,” deductions and exemptions get phased out for “wealthy” individuals. In that event, they would clearly be more useful in 2012. •	Determine your current marginal tax bracket, and if you are still in the 15% bracket, my feeling is that you should look to maximize your income to the top of that bracket ($70,700 for married couples and $35,350 for individuals). A 15% tax rate, in my opinion, is pretty attractive; as an added plus, capital gains and dividends are currently totally non-taxable up to the 15% bracket limit. •	Increase your charitable deductions by giving clothing, household goods and other items to local charities such as the Bargain Box. Smart tax payers do this every year, without fail. Better yet, open a Charitable Giving account at Schwab, Fidelity, Vanguard, etc. and donate appreciated stock or mutual fund shares prior to year end. That way you are credited with the charitable deduction at fair market value, but do not have to recognize the capital gain. •	Pay outstanding medical bills in 2012 if you can, particularly if you are close to the 7.5% AGI threshold. As mentioned above, this threshold goes to 10% in 2013 for those under age 65 and will be that much tougher to reach. •	Write off business assets. If you own a small business, you can write off up to 100% of the cost of a business asset, including a business auto if it meets certain weight restrictions. This is true in 2012 even if that asset is purchased on credit (Code Section 179). Again, consult your tax pro on this one; there are lots of limitations and qualifications that must be met. •	Take advantage of employer-provided tax deferral programs such as retirement plans, HSA accounts and cafeteria plans. These deferrals are almost always smart tax moves. On a more general financial planning note, make sure to take full advantage of any employer match on retirement plan contributions and charitable contributions. The estate and gift tax exemption is $5,000,000 this year. If the fiscal cliff happens, it will drop back to pre-2001 levels, or approximately $1,000,000. Despite that, the planning opportunities here are limited, since dying this month is a really bad suggestion, and giving away up to $5,000,000 may not be helpful in the long run, since the gift will probably ultimately be taxed under the estate and tax rules in effect when you die. So get to it! Be smart and call a tax pro. By sitting down with your tax pro in December when he or she can actually relax, ask questions, ponder, and perhaps come up with some really creative ideas for improving your short- and long-term financial situation. Remember: CPA’s do not ponder once “tax season” begins and the floodgates open.